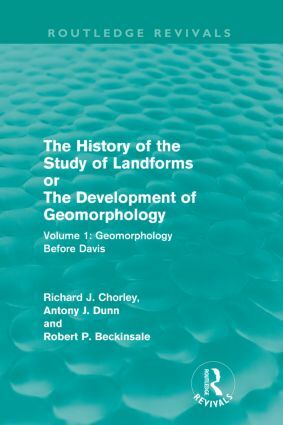 This re-issue, first published in 1964, is the first of a seminal series analysing the development of the study of landforms, from both the geographical and geological point of view, with especial emphasis upon fluvial geomorphology. Volume 1 treats the subject up to the first important statement of the cycle of erosion by W. M. Davis in 1889, and attempts to identify the most significant currents of geomorphic thought, integrating them into the broader contemporary intellectual frameworks with which they were associated. As well as dealing with such key figures as Werner, De Saussure, Hutton, Playfair, Buckland, lyell, Agassiz, Ramsay, Dana, Peschel, Powell, Gilbert and Davis, attention is also given to many less important contributions by American, British and continental workers. A spirited biographical treatment, attractively set off by contemporary portraits, diagrams and sketches, will make this book of great interest to the historian of science, and indeed to the general reader, as well as to the student and scholar in geomorphology, hydrology and any other earth science.